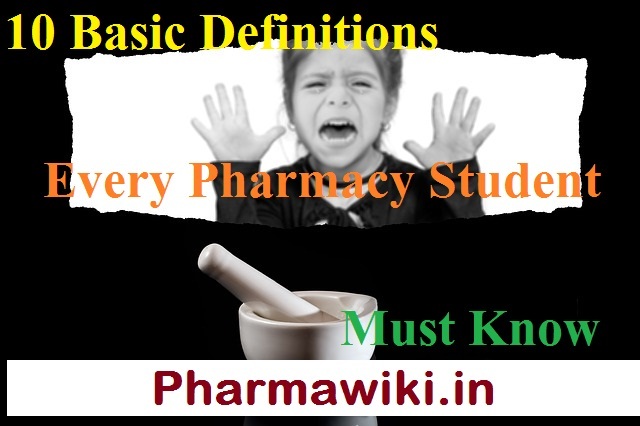 Hello readers, Here today we present 10 Basic Definitions Every Pharmacy Student Must Know. This Pharmacology Notes will help all the B Pharm D Pharm Students. Pharmacology is the study of interaction of drugs with living organisms. It also includes history, source, physicochemical properties, dosage forms, methods of administration, absorption, distribution mechanism of action, biotransformation, excretion, clinical uses and adverse effects of drugs. It evaluate the pharmacological action of drug preferred route of administration and safe dosage range in human by clinical trails. Drugs are chemicals that alter functions of living organisms. Drugs are generally given for the diagnosis, prevention, control or cure of disease. It is the science of identification, selection, preservation, standardisation, compounding and dispensing of medical substances. The study of the biological and therapeutic effects of drugs (i.e, “what the drug does to the body”). Study of the absorption, distribution metabolism and excretion (ADME) of drugs (“i.e what the body does to the drug”). It deals with the proper selection and use of drugs for the prevention and treatment of disease. It’s the science of poisons. Many drugs in larger doses may act as poisons. Poisons are substances that cause harmful, dangerous or fatal symptoms in living substances. It’s the effect of drugs upon microorganisms, parasites and neoplastic cells living and multiplying in living organisms. An official code containing a selected list of the established drugs and medical preparations with descriptions of their physical properties and tests for their identity, purity and potency e.g. Indian Pharmacopoeia (I.P), British Pharmacopoeia(B.P). Hello readers, hope you got these 10 Basic Definitions of Pharmacy . This Pharmacology Notes will help all the B Pharm D Pharm Students to get the basic idea of general pharma definitions.